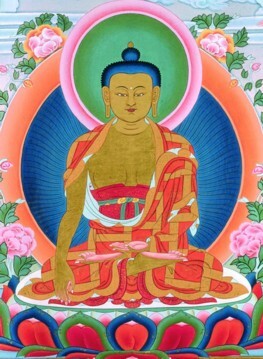 Buddha Shakyamuni (Skt. Śākyamuni; Tib. སངས་རྒྱས་ཤཱཀྱ་ཐུབ་པ་, Wyl. sangs rgyas shAkya thub pa) — the Indian prince Gautama Siddhartha, who reached enlightenment (and thus became a buddha) in the sixth century B.C., and who taught the spiritual path followed by millions all over the world, known today as Buddhism. Gautama, Kinsman of the Sun, Son of Māyādevī. Tulku Thondup, Masters of Meditation and Miracles, edited by Harold Talbott (Boston: Shambhala, 1999), 'Shākyamuni Buddha'. Quotations: Sutras, a collection of quotations from different sutras. This page was last edited on 27 November 2017, at 21:32.